Register Your Modding Teams Below! Eight weeks, four themes, four mods, only one team of modders will rise up to claim the throne as the ultimate modding champions of 2017! This is Morrowind Modding Madness, a two month long modding competition starting September 1st and going through to October 31st where modders form teams, compete and vanquish challenges, and rise through the ranks to become the ultimate modding champions of 2017 with all the sweet prizes that entails! This is modder on modder, mod on mod, gladiatorial creativity as you've never seen it before! I've included a breakdown of how this competition works, how you can register and signup for the competition, as well as potential prizes down below. Don't know how to make mods? 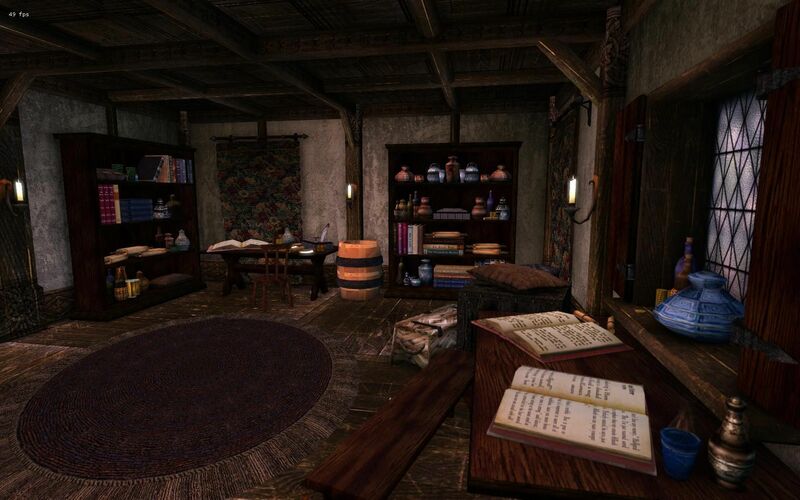 Check out our Let's Mod Morrowind tutorial videos! You can still signup by September 1st! This a team-based modding competition, that means you need to form a modding team and register it in order to enter the competition, and trust me, with the way this competition is setup, you're going to want to have at least one teammate to work with. Now modding teams can be composed of a minimum of two modders and a maximum of four modders, and ideally, you'll want to gather a team of modders from different fields in order to make the most creative mod possible. Making a quest is always a good way to boost your mod, but what if one of the opposing teams has a talented modeler? Certainly you can outmuch their innovation by just using vanilla assets, but do you really want to take that chance? Likewise, a professional scripter will make your mods come alive, and that might well give you the edge in this creative battle of wits and madness. Whoever you pick to be on your team, you'll need to work together, collaborate, plan out your mods, and successfully release them on time in order to win and claim the top prize. In order to register your modding team for the competition, you need to first make sure you've got a list of your fellow modders who you want to team up with and who have agreed to work with you, then you need to come up with a team name (nothing offensive, I will rename your team if you submit something inappropriate!) and submit that team name along with your list of modders in a post either here or on one of our forum threads at Morrowind Nexus, Great House Fliggerty, r/tes3mods, or the Morrowind Modding Showcases Forums by NO LATER than the end of the day September 1st. New teams CANNOT apply for the competition after September 1st, that's when the competition starts and we need to have a firm list of participating teams by then! Once you've got your modding team assembled, be ready to start on September 1st with the first wave of modding challenges! In order to make it to the top and be declared the winners, each team must survive a number of modding challenges. Unlike last year, you'll get two weeks to meet each challenge, so you'll have an entire 14 days from when a challenge theme is announced to build and release a mod that fits that theme. Now for the second big change here, these themes aren't based on categories but rather general themes like factions, architectural styles, or play-styles. 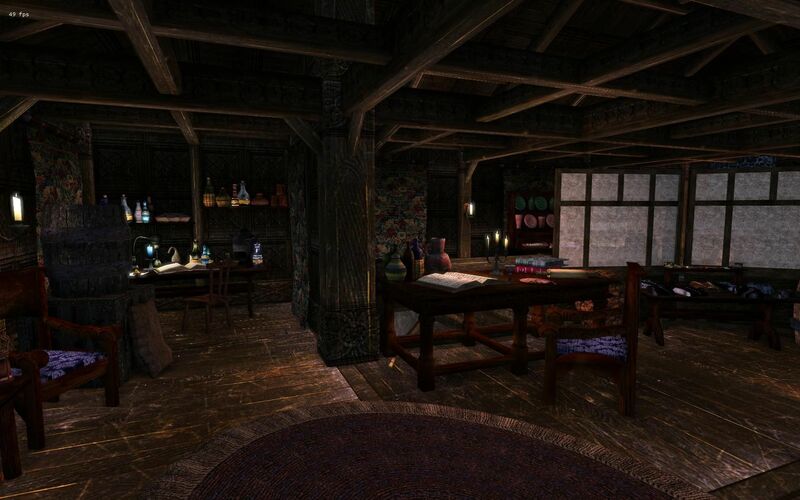 So one week might be Daedric-themed mods, another Sea-themed mods or Telvanni mods or Necromancer mods or so on and so forth. The theme will only be revealed the day before the challenge starts, so each modding team only has two weeks to prepare, build and release a mod of their own making. With such a short window of mod development, teams will need to strategize, either join together and collaborate on one mod to get it done faster, or divide off and build individual mods to try and guess the upcoming themes ahead of time and get more mods finished. In total, there's eleven different potential categories that could be used in the competition. These categories are randomly selected right before each challenge, and since there's only four challenges to this event, that means only four of these categories will be used, and not even I will know which ones that will be ahead of time. 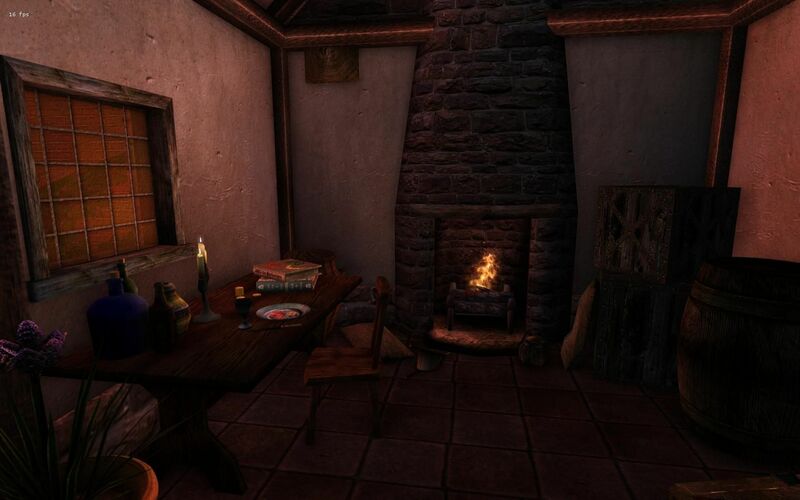 The potential categories are as follows: Daedric, Mage, Thief, Warrior, Dwemer, Great Houses (Telvanni, Redoran, Hlaalu, Indoril), Solstheim/Bloodmoon, Mournhold/Tribunal, Sixth House, Sea/Ocean/Coastal, Religious (Dunmeri Temple, Imperial Cult, Other). These are all extremely broad and open-ended categories, so you just need to make sure your mods at least partially meet the category definitions for each week. Now in order for your mods to count towards the competition, when you release a mod for one of the challenges, remember to include a line at the top that says 'Part of the Morrowind Modding Madness Competition' and a line right below that with your team name like "Team Cliffracer" or something like that. Your mod will automatically be entered into the competition and be sent to our judging panel for scoring. And you can upload your mods to both Morrowind Nexus or Great House Fliggerty, both sites will work fine for mod releases. At the end of each challenge, all mods submitted by each team will be featured in one big weekly wrap-up video on the channel, so all mods will receive equal attention on the channel, regardless of where you post your mods for the competition. Keep in mind, you MUST release your mods by the end of each challenge's 14 day period to be counted towards the competition, we will not accept late entries! There are definite deadlines here! This is another area where this year's competition is a lot different from the 2016 season of Morrowind Modding Madness. Unlike last year where we had a ranked scoring system using both judge-based and popular vote scores, we're completely doing away with the popular vote this year due to just how inaccurate it can sometimes be. Instead, we'll be doing a complete judge-based scoring system this year, with scores tilted in favor of creativity. At the end of each challenge, judges will go through and play each mod for the next 7 to 10 days, and the results of their scoring will be posted publically, so teams will know how they're ranking so far in the competition. Each mod contributes a bit to the team's ranked score, so if a team has one fantastic mod, but didn't meet any of the other challenges, they could still lose the competition as a whole, hence collaboration and working together will be key to winning victory. And to go a bit into some detail here, the total score that each mod can receive for the competition is 10 points. Hypothetically, if you release one amazing mod that everyone loves, your maximum score is 10 points, but another team could release two semi-good mods that each get six points each and they'd technically be ahead of you in score, so the goal isn't just to release one great mod, it's to make sure you manage your time well, meet the themes, and release a lot of good mods over in order to stay competitive with the other teams. Now let's talk about prizes, because I know you guys love prizes. Besides the fame and glory of coming out ahead of your fellow modding teams in gladiatorial creativity, each team that gets the highest mod score each week will get a set of Steam and Indie game prizes that they can choose from, and the grand prize winners will get a ton of Steam and Indie games as well, and not only that, they'll be declared the Ultimate Modding Champions of 2017 with all the bragging rights that entails! 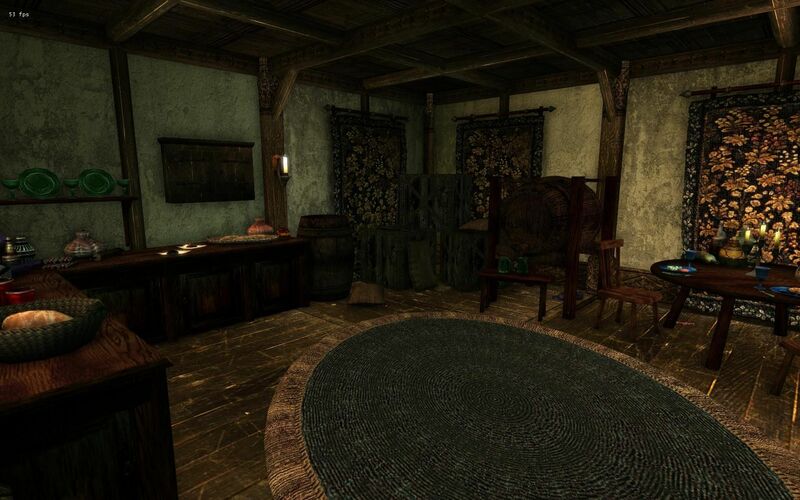 To be sure, 2017 has been a great year as far as Morrowind modding is concerned so far, with the community on track to release nearly 600 mods by the end of the year, and let's not forget all those province mods and Morrowind multiplayer that also saw a release this year. Things are looking pretty great right now, so let's keep up the momentum with another exciting competition! Best of luck to all of the contestants, I hope this competition can be a fun and exciting event for all of you, and may the best modding team win! Happy Modding and May The Best Games Never Die! Alright, I know I said July 31st would be the last deadline for modder claims, but there's a few things I sort of forgot about. Namely I think a lot of people took this to mean that they had to get their claim 100% done within that time-frame, and that's really not what I meant. Regardless of whether your claim is incomplete, please post it in your claim thread. 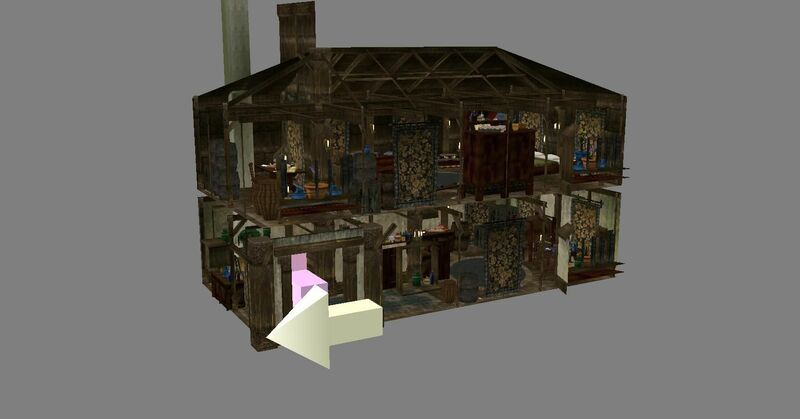 We mainly need to have a list of locations that are going to be in the game for dialogue and questing purposes, so claims don't need to be 100% finished right away. If you have the exterior finished and some of the interior work done (preferably at least half-done), we can probably still use it. Likewise, I was going to go through the list of modders who haven't posted a status on their claims and send them reminders to submit their files, but I never quite got around to doing that, in part due to just getting preoccupied with other things, and partly because July has not been a good month for me for anything, so a lot of things got left on the backburner, and that's unfortunate since I want to give everyone at least a chance to get their files into the project (since this is a community project after all). Anyway, I'm moving the deadline to August 12th, and I'll be messaging the remaining absentee claimants over the next three days, so hopefully that gives everyone enough time to submit their files. If you've already submitted your claims, I'd encourage you to submit ideas for quests you'd like to see in ModTown, since questing and dialogue will be the next, official, stage of the project after August 12th. Below you'll find a basic list of some of the main characters for ModTown 2015, this is only a partial list and doesn't include any of the guilds as of yet or any other minor characters of importance that we might want to add later on. Each character has a name, class, race, and a summary to give you an idea of their personality and history. You can use this information for developing dialogue topics, and you're also free to claim one of these characters to fully develop with dialogue or quests as you so desire (remember to make a new topic when claiming NPCs), and if you do claim an NPC, you're free to change the personality and the history of that NPC if you want, just be sure to make note of the changes. This list will be updated later one when we have more NPCs developed. In the meantime, if you have any questions regarding NPC development, please post them below. NPCs are organized by location (i.e. public building or buildings that they're associated with). 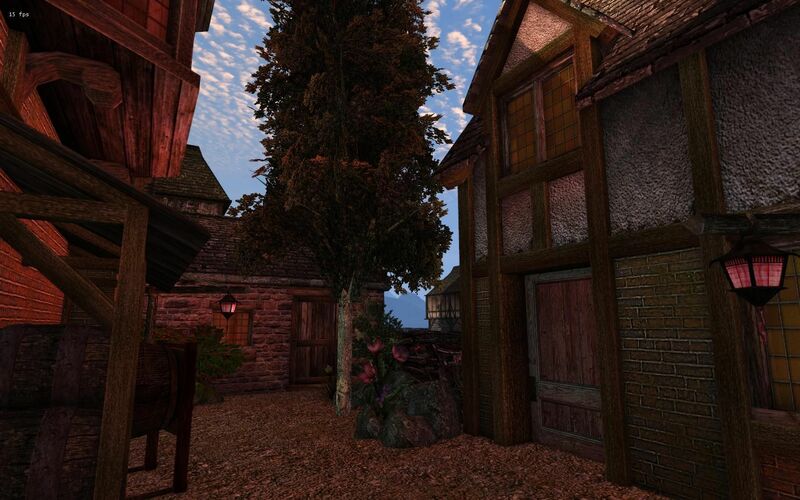 Summary: Sinerion is the captain of the guard for the town barracks, found at the gates to ModTown's central square. A rather typical haughty high-elf, Sinerion is a veteran of several minor conflicts from the Tamriel mainland before he moved to the more peaceful, yet occasionally dangerous, shores of ModTown. Used to resting on his laurels after years of only dealing with minor modder mishaps, Sinerion is a bit slow to react to new events, believing himself more than capable of handling anything that should come ModTown's way, and partakes in a little too much drink from time to time (which is to say most of the time). Summary: Jurgmm is one of several blacksmiths and armorers in ModTown, though he often tells his clients and anyone who'll listen that he was the first blacksmith in ModTown and he still has the finest wares and the best forge in the city, though his competitors dispute that point vehemently. Slow to anger and quick to strike a bargain, Jurgmm is unnaturally inclined to negotiate and barter for a Nord, and this trait of his personality has won him many friends in town, including a business contract with the town guard to provide them with new weapons and armor. Summary: Unlike in Seyda Neen, the Census & Excise Office of ModTown is not an Imperial institution but rather an outreach of the Community Consortium, which likes to keep track of the comings and goings of new immigrants and tourists to the island. As such, Covelga Arrenix, who runs the C&E, is technically attached to the Community Consortium, having an official rank of Community Assistant within the faction, but other than filing reports with the Community Consortium regarding new arrivals, she keeps to herself in the offices away from the main CC compound on the other side of town. A former contractor with the East Empire Company in the Imperial City, Covelga Arrenix is accomplished at the art of bureaucracy and has streamlined the process at the Census & Excise for efficiency, ensuring a never-ending stream of trade and prosperity to ModTown, though she herself is rather suspicious of the modders that live here and suspects that, inevitably, the whole town may one-day collapse from the dubious modder experiments that so often cause disturbances in ModTown. The Community Consortium hierarchy consists of four central characters that are essential to the main quest. We'll need to develop side-characters later on, but for now these four are the ones we dialogue profiles for the most. Summary: The current leader of the Community Consortium, Davthas Felano was once a true-believer in the cause of ModTown, coming here at an early age and working his way up through the ranks of the Community Consortium with an unbridled passion for assisting the works of modders. These days, however, his faith in the modders of ModTown has long since been shaken by their aloof and often despondent natures, a betrayal that makes his hardwork and commitment seem worthless. So it was that Davthas Felano decided to take what was owed him, initiating a scheme with a large number of the Community Consortium leadership to start draining the town's coffers. After all, if the modders couldn't be bothered to show themselves, why not help themselves and profit before the town sinks into Oblivion? 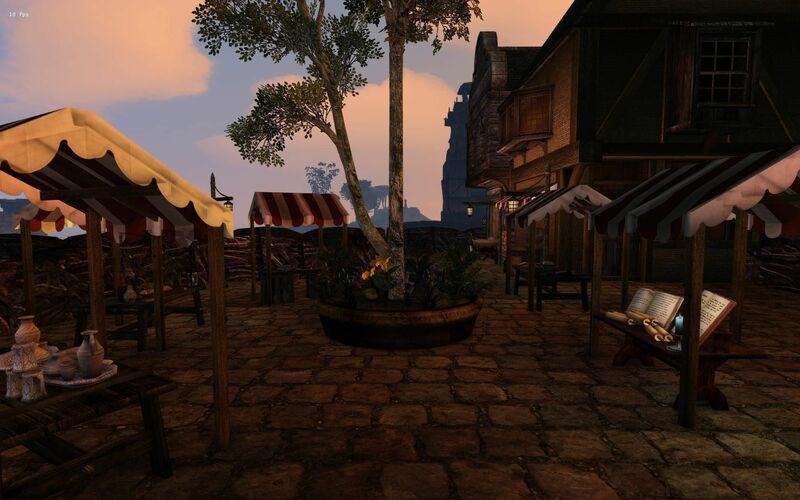 Outwardly he projects the same stern stewardship of ModTown that has won him much respect amongst the locals, but inwardly he delights at his revenge coming to fruition and soon ModTown will be septim-less to be left to the ravages of rabid dogs and destitute modders. Summary: In charge of development and recruitment for ModTown, Vireiene Geleitte is the Community Consortium's hard-working ambassador to the outside world, often seen late at night hammering out contracts to bring new goods and services to ModTown or at the docks preparing to leave on yet another journey to find some undiscovered talent that could add to ModTown's fortunes. 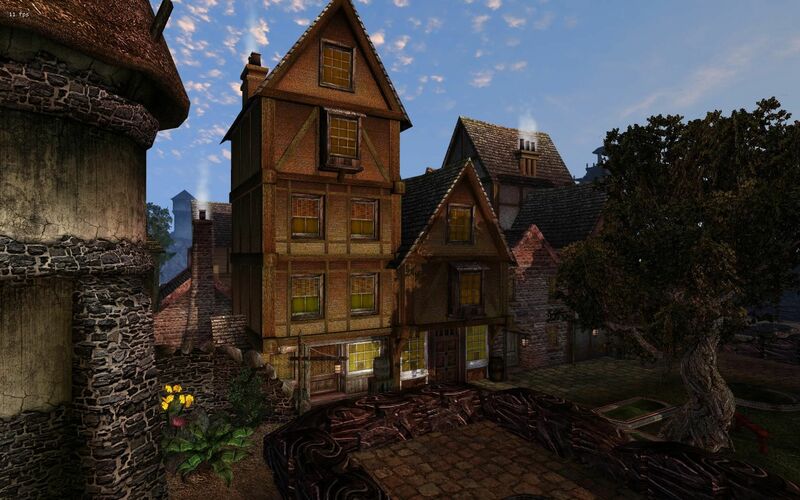 Vireiene, unlike the Grand Architect, believes stronger in the Community Consortium's mission and the abilities of the town's modders to provide prosperity for them all. Coming from a humble background, having immigrated to ModTown from the Imperial City's poorer districts, Vireinne has worked her way up to Community Ambassador and keeps a tight schedule for new recruits coming into the ambassadorial department, often demanding a strict workload for the good of ModTown, though recently she has begun to suspect that the Grand Architect's orders are not, as she originally thought, to the benefit of the city, but at this time these are little more than suspicions that confirmed beliefs. Summary: The Community Secretary, and the initial person that the player takes quests from in the Community Consortium, Berthadan Oakmire is responsible for handling most new recruits to the Community Consortium, providing them with the basic tasks and skills necessary to move up in rank, though most recruits remain at the assistant level doing the Consortium's day-to-day work. A mage of only moderate skill but considerable ego, Berthadan has often considered himself meant for greater things and has long held a grudge against the Community Consortium for leaving him stagnating at such a lowly rank, handling such tedious affairs as the ever-strange requests and supplies for the modders of ModTown. Once the storied hero of magical potential back in his hometown in Valenwood, Berthadan has found himself outmatched and outclassed time and time again by the more skilled and powerful types that ModTown attracts, and he's come to despise both the town and the modders that reside there. For this reason, he was one of the first that Davthas approached about his scheme to siphon off ModTown's coffers, and Berthadan's position makes him ideally for hiding certain expenses as being nothing more than supply requests from modders. Summary: The current Community Fixer, Yisrey, is one of the highest ranked members of the Community Consortium, serving the city of ModTown for years and has earned much respect from both the town's locals and the modders that reside here for quickly servicing the needs of the community and playing a large role in the town's expansion over the years. Deadly with a blade, but quick to smooth over hurt feelings through negotiation, she's won many friends inside and outside the Community Consortium, yet the Grand Architect has been pushing for her retirement, and after years of service, she seems likely to concede, though suspicious of the Grand Architect's intentions. But Yisrey is loyal to the core, both to the community and the consortium, and so hasn't even considered the possibility of what Davthas is really up to, at least not yet. Summary: Commander of the garrison that guards the harbor to ModTown, Mecipius is a principled and steadfast man that takes the protection of ModTown quite seriously, unlike his counterpart Sinerion, though he has a lingering distaste for the dangers that modders introduce with the modding meddling. 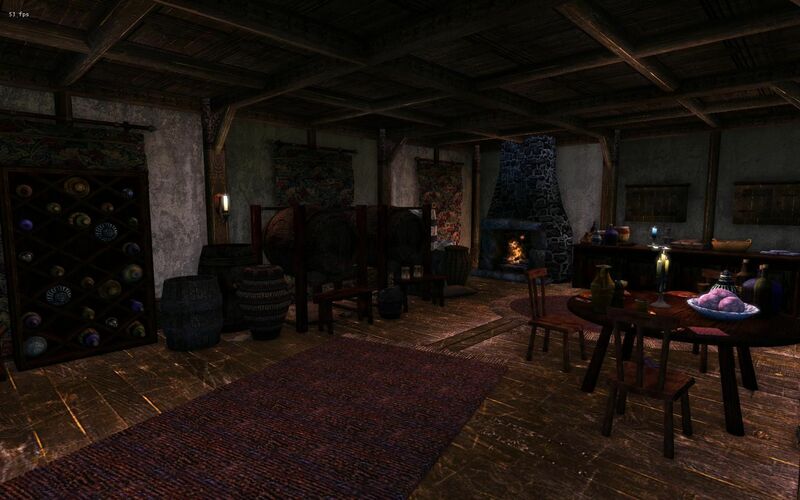 As a recent arrival himself, he has yet to acclimate to these strange modder creatures that make ModTown so unique, but outside of that group he has made friends with a few of the locals, such as the blacksmith Jurgmm and the publican of The Esteemed Alit Inn, where he's prone to drink after a long day. Summary: Leodonia is the primary trader in the Merchant Hall, selling goods out of her first-floor shop, and she's often looked up to as the primary organizer for the Merchant Hall, ensuring all vendors get a fair treatment and booths get properly setup so as to attract foot-traffic. 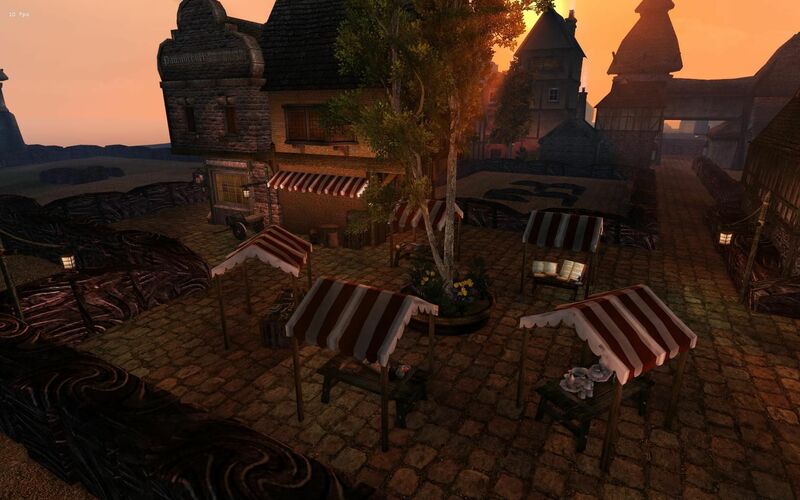 Arriving from the distant Imperial city of Anvil, Leodonia is one of several merchants that came to ModTown to strike their fortune, hoping that the create madness of the town's modders would help to fill their own coffers, and in many respects this seems to be the case, business is booming and there's a demand for everything. 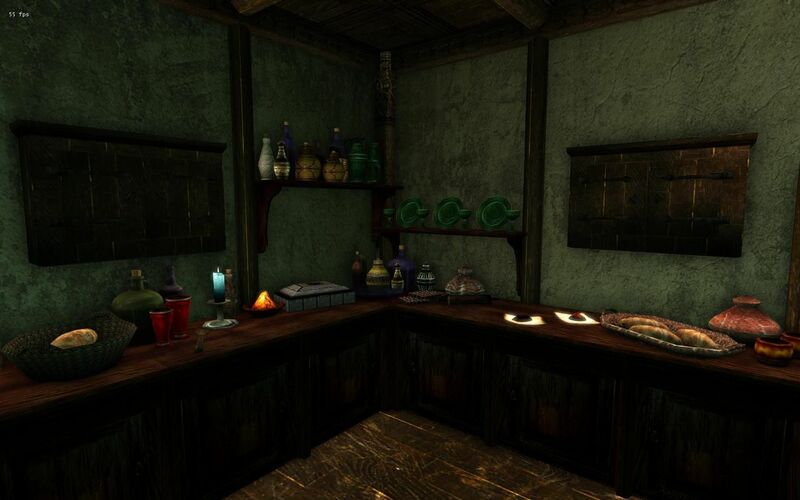 Summary: A small-time alchemist, Vericnach is one of the central shopkeepers in the Merchant Hall, keeping a walk-in store on the second-level that provides a modest selection of alchemy goods, from simple potions to relatively common ingredients. 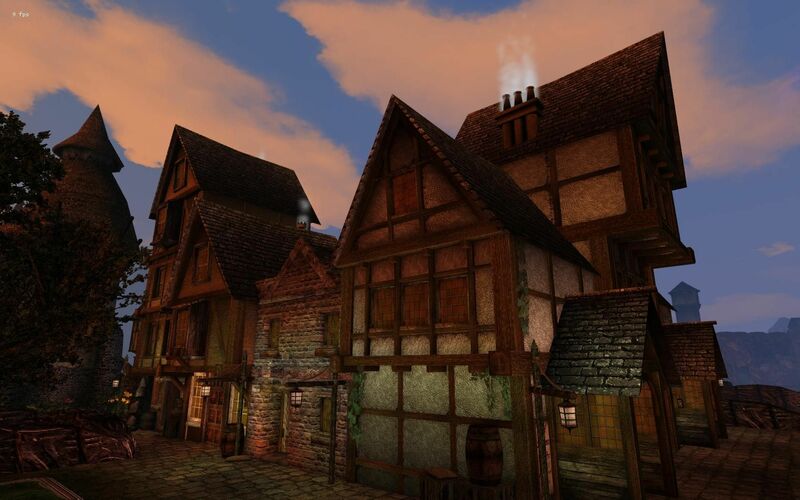 As with the blacksmiths, there's a lot of alchemists in ModTown, and Vericnach is in fierce competition with many of them, most of which have more visible storefronts or a higher-standing in the community, but regardless he does good enough business, enough so that he has a running competition with his neighbor, Ironon the enchanter, over who can bring more customers to their respective shops in the Merchant Hall. 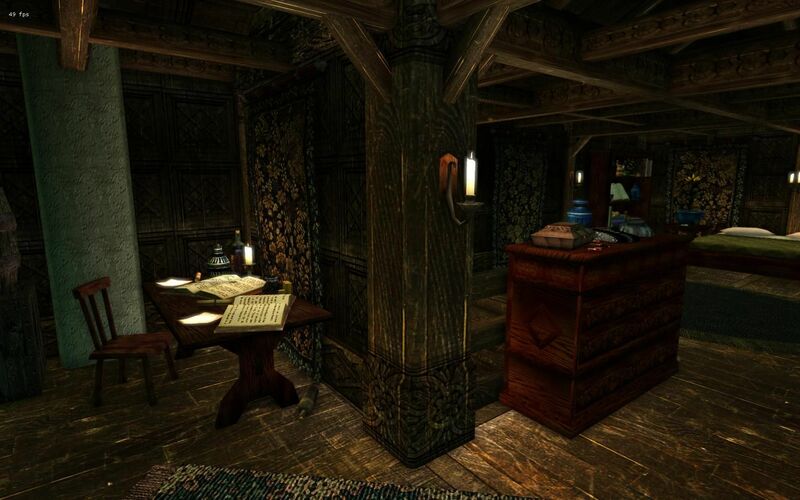 Summary: The proprietor of one of the second-level shops of the Merchant Hall, Ironon is by all accounts a failure of an enchanter, not that he would ever admit it. Many of his more complicated enchantments have a tendency to...backfire, and usually with disastrous results for the user. As such he has a certain reputation in town, and most of his actual sales are in minor enchantments that even he couldn't mess up, probably. Though thanks to the constant stream of tourists and outsiders, he finds plenty of customers for his wares, even the more questionable ones. Summary: Dulabuk is yet another one of ModTown's numerous blacksmiths, and the resident armorer at the Merchant Hall, though unlike his compatriots in the Hall, his forge has often been neglected with few customers. Left to rot in the Merchant Hall basement, Dulabuk doesn't get the street traffic as other merchants might, and with Jurgmm's establishment just blocks away, many of Dulabuk's customers end up going elsewhere. It doesn't help that he has a short-temper and happens to be quite rigid with his prices, and rumor has it he's taken a personal disliking to Jurgmm, though how far he might take a rivalry is unknown. Summary: The proprietor and owner of the Merchant Hall, Iminda is the one responsible for making sure everything runs smoothly, and although he leaves much of the organizational work to Leodonia, he also runs the Merchant Hall inn and bar, which provides food, drink, and lodging for weary travelers and merchants. 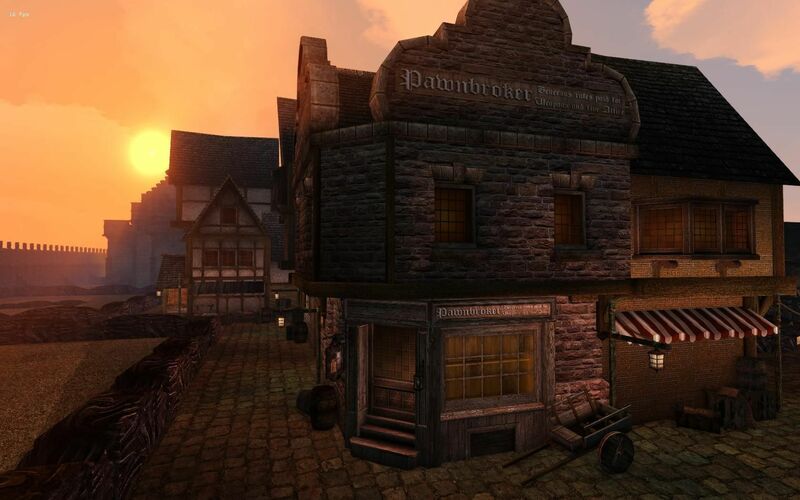 Originally from the distant shores of Hammerfall, Iminda was one of the first merchants to arrive in ModTown during the early days of the Consortium's control, and he established the Merchant Hall as a way to grow business by providing a common environment for many merchants to thrive in at once, and for the most part, this has been a successful endeavor, though as ModTown has grown there's been an increasing number of competing shops that have driven business away from the Merchant Hall. Summary: The main, and really only, priest at the ModTown temple, Gynice Elbene oversees all of the various faith alters and pews, making sure each section is properly cared for. Although technically a priestess of the Nine Divines, Gynice is what you would call a true-believer in religion itself, and supports all beliefs equally, even the strange and mysterious ways of the Dunmer and the sometimes brutish methods of the Daedric worshippers. All are welcome in her temple, so long as they keep the peace and are mindful of those with different beliefs, though there's some rumors that say that, far from being just a priestess of the Divines, Gynice has also dabbled in Daedra worship herself, but there's no telling if there's any truth to that. 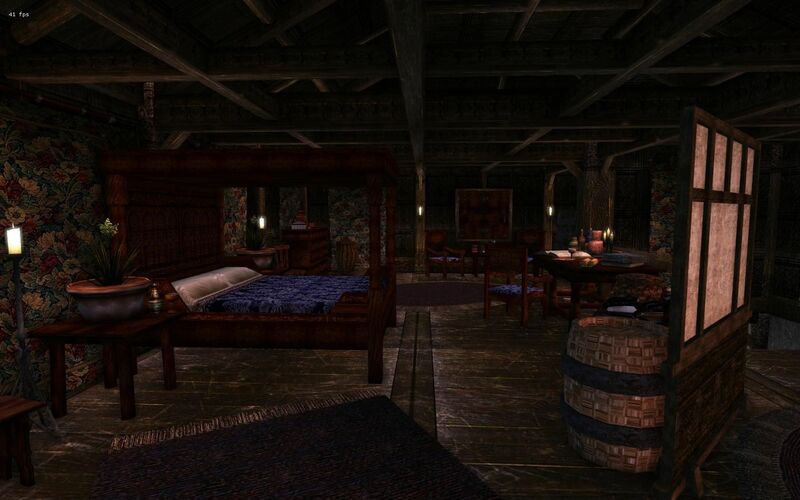 Summary: Malvie Selotal is the proprietor of the Esteemed Alit Inn in central ModTown. A self-made woman with a successful business and prime real-estate along ModTown's City Square, Malvie has made a small fortune with a number of employees working directly under her. Despite her wealth, she lives modestly, keeping a small room on the property as her only home. 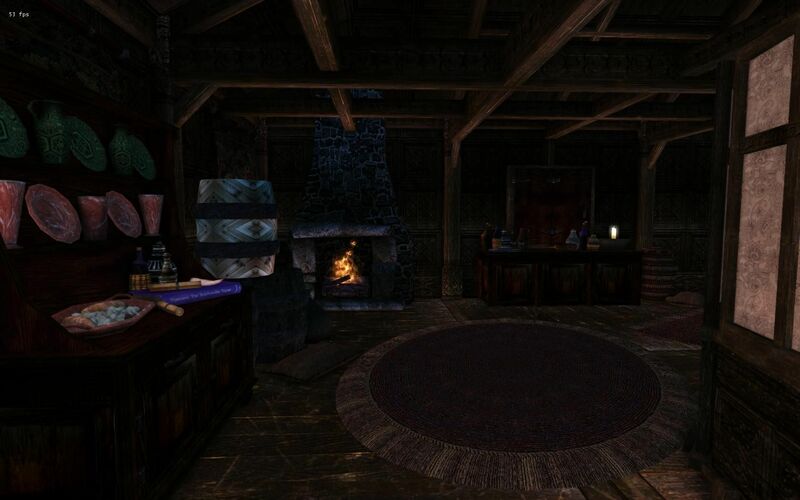 As a result, she rarely leaves the inn and can be seen tending the bar at practically all hours. A bit of a socialite, and a long time resident of ModTown, she's keen on all of the latest news and gossip going about town, and knows much about the resident modders. I've been a bit silent of late, mostly due to writer's block and my inability to make progress writing up a detailed main-quest that I can be satisfied with, but its come to my attention that we're going to need to set a direction and a set deadline for ModTown 2015 for the project's completion. So that's what we're going to do today, and you'll find complete details of what our priorities and objectives will be from now on down below, as well as our deadline, or as I should say deadlines, for project completion. First and foremost, we're closing off all public and modder plot claims starting on July 31st. That'll be about one year after the project went public, so that should be plenty of time for everyone to have completed their plots. This means you'll need to have all of your modder plots and public building claims submitted BY July 31st! Note that this does not include NPCs, dialogue, quests, or dungeon claims, we'll continue to accept those claims after July 31st, but in order to have a solid understanding of what quest and dungeon developments we need to do, we need to have a lock on the modder plots and public buildings first. #1 - Finish off current and in-progress modder plots and public building claims. Any unfinished claims will either be removed by Melchior or replaced with one of the backup interior claims we have on file (currently we have a dozen houses, shops, and taverns on backup that we can use to fill in holes -- this is a last resort though, as ModTown is supposed to be a community project, not a Darkelfguy/Melchior project). #2 - Design and implement NPC characters with dialogue in ModTown. You'll now find a list of NPC characters that are currently slated to be added into ModTown 2015 with basic personality profiles and brief backgrounds over in the NPC/Dialogue subforum. This initial list consists of the important characters that currently play a role in ModTown's NPC community leadership. 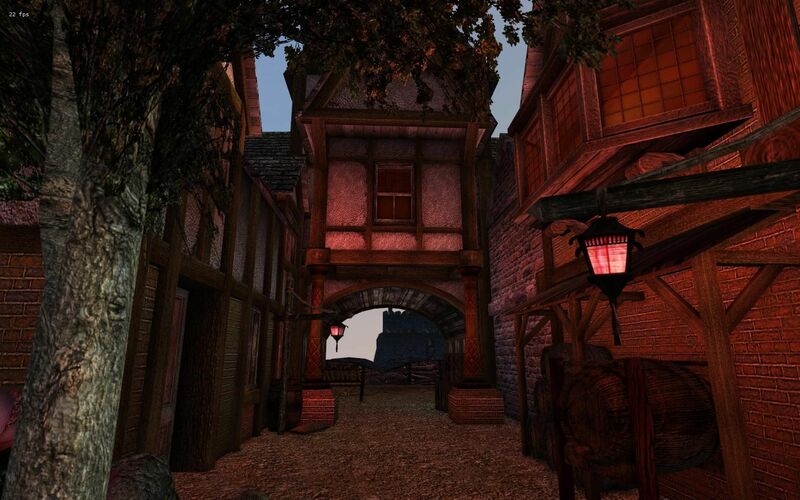 Once these are all implemented, we can begin work on implementing a main quest and sidequests that impact the town. Anyone who has any ability with writing or designing quests is encouraged to submit a claim for one of the NPCs and implement them into the game with full or partial dialogue profiles. It shouldn't take very long to develop each NPC, they just need between 400 and 800 words of unique dialogue each ideally, and since we have a list now, they can reference other NPCs in town without leaving obvious dialogue holes. #3 - Build Dungeons - We have a few dungeons already added in, but a lot of dungeons seem to be connected to modder plots so far. What we really need are some random dungeons around the island itself that we can use as quest locations, so if you have some ideas for a dungeon design, please go ahead and start working on it! Dungeons can be submitted after July 31st, so the deadline isn't as eminent here and there's still time to work of them. #4 - Design and Submit Quest Design Documents - This is a slightly lower priority at the moment, but we need misc. 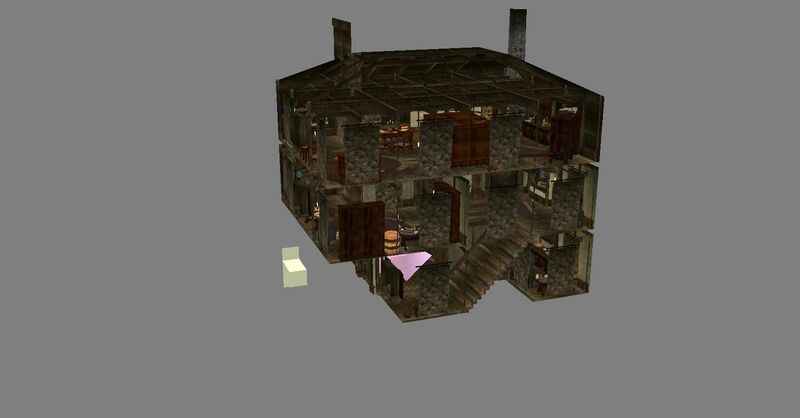 quest design documents and potential overarching community quests to help fill ModTown with playable content. 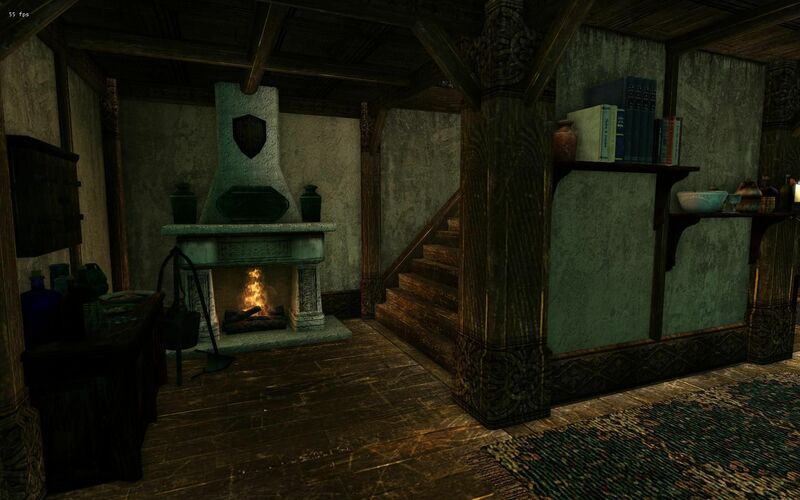 Ideas for the main quest will also be welcome, we may need to revise the initial main quest document, so any concepts for improving the main quest or ideas for various faction quests that the player can go on will all be taken into consideration. Now you'll notice I haven't mentioned a second deadline yet, and while obviously the public buildings and modder claims deadline is set in stone, the deadline for everything else is up in the air. At this point, the second deadline is simply whenever ModTown is done, since I can't quite calculate how long it'll take to finish up quests, NPCs, and the remaining dungeons, but I would say that, for now, the soft deadline to have everything finished is the end of September. We'll have to see if that proves effective or not, and there'll be another news update on that front when we get closer to that date. In the meantime, I recommend everyone who's still working on a plot just focus on getting it finished. There'll be a ModTown progress video this weekend showing off a lot of the progress that you guys have submitted (and if you have anything specific you want shown in the video, you're encouraged to post files below), and we'll have an official channel news video that'll be covering the new deadline as well. If you have any questions about these deadlines or priorities, please post them below. Now onto the next order of business, I would like to announce that we're now hiring new admins and staff for the forums. As you may have noticed, I'm not around very often, and this is in large part due to the fact that I'm just stretched pretty thin, making videos takes up most of my free time and as such I often have difficulties keeping up with everything. So I'd like to open up new leadership roles here for those interested so we can keep things progressing forward, even when myself and Melchior Dahrk are otherwise occupied. If you're interested in becoming an admin, please post your application below, and keep in mind only long-term members of the modding community of stable disposition will be considered for these positions. Thanks for reading, and thank you for your support of ModTown 2015, I hope you'll all bare with me as we try and get this project finished up in the coming months! Master Planning and Discussion / Happy New Year! Here's the ModTown 2015 - Official 2016 Trailer! Happy New Year everyone! I thought we'd get the new year started off with a bang with a little hype trailer for ModTown! I've been busy at work on this for the past few days, so I apologize if I haven't been around much, but the good news is that I have enough leftover footage for another two trailers in the future! Anyway, I know things have been a little slow lately, and that's mostly my fault since, ironically, I haven't dedicated as much time to promotion as I should. Well, that's going to change, in addition to our monthly progress development videos, we'll also be doing monthly trailers for the next couple of months, since that's a slightly better hype mechanism than a development video, and I'll also be posting weekly screenshot albums on Tumblr and Morrowind Reddit for some additional promotion, as well as daily screenshots on Morrowind Nexus. With any luck, that'll all draw some more attention, and modders, to the project. If you have any screenshots you'd like to share of ModTown 2015 and your claims, do please post them and I'll add them in with our weekly albums! That's all for now, again happy New Year, and happy modding everyone! Master Planning and Discussion / Announcement: November Progress Video - Post Demo Files by December 17th! Greetings, I know I haven't been around much lately and that I've been a bit slow to get things organized, so to make this official, we're now taking demo files until December 17th. I know this is all awfully late for the November Progress video, but I intend to make this up to you guys with a followup video in time for Christmas, an official ModTown 2015 trailer with all of the hype bells and whistles I can attach. But until then, there's still the November Progress video, so please post your demo files below by the 17th in order to get them included in the official video! And also, for anyone who missed it, ModTown 2015 has been extended until Spring of 2016, so there's still plenty of time to work on your claims if you've been (as I have) busy with other affairs. Thanks for reading and participating, with any lucky we'll have a ton of progress to show off in this next video and an awesome new trailer for the holidays! Hey guys, know I haven't been around much lately, but I'm looking to start work on the quest side of things for ModTown and thought I'd get started by converting a bunch of the quests I did for Tales of the Ascadian Isles over to ModTown to add a little meat in the random questing department. Most of these quests will require very little tweaking to fit into ModTown, they might need some additional dialogue and minor word replacement, but otherwise they should prove modular enough to port into the ModTown project. Anyway, I've included the first quest design document here. Before I actually implement it, I was hoping someone might be willing to go through and proof-read it. The document was originally written a while back and I'm not so sure if all of the writing should be kept, or if parts ought to be re-written or scrapped to sound less cheesy. In total, there were 28 quest design documents written for Tales of the Ascadian Isles before the project was abandoned, I estimate that at least 15 of these could be easily ported into ModTown to add extra content, including three or four already finished dungeons. But in any event, as with any type of creative writing, these quests really need some peer-review before getting added to the project, so let me know what you guys think about this first quest! 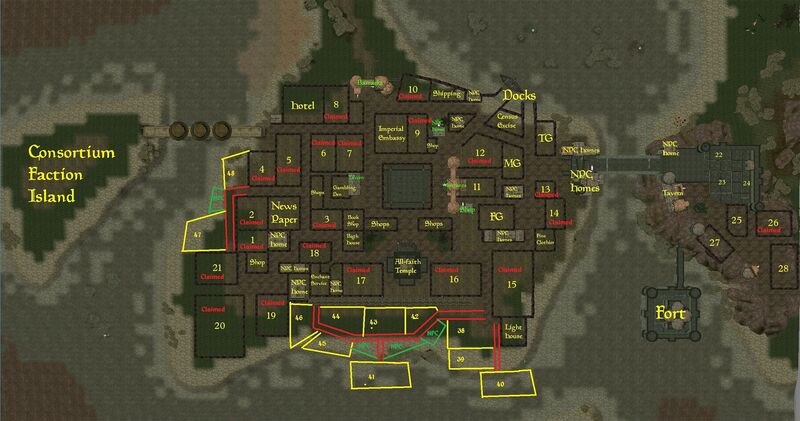 PS: The quest document isn't quite as organized as the one I did for Let's Mod Morrowind, because it wasn't really meant for public consumption, so if you have any difficulty understanding the layout, please let me know. Master Planning and Discussion / Announcement: October Progress Video - October 17th - Post Your Demo Files! Greetings everyone, as you all know, we did a September Progress video a couple of weeks ago, but due to the nature of the project with everyone working on their own thing, we were only able to show off a small portion of total progress. So this time around, I'd like to announce that we'll be taking WiP demo files of any and all claims in order to more accurately show off the progress on ModTown 2015 for the October Update video! If you want your claim to be featured, just post below with a file attachment and it'll be included in the October video. You have until roughly October 15th~16th to submit any WiP files to be featured, and of course, please let me know if there's particular sections you'd like highlighted or avoided. 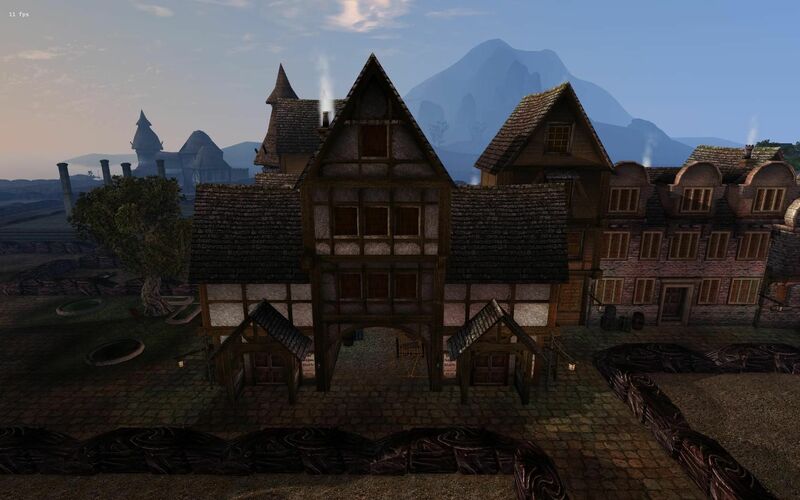 Some of you may recall I posted a resource request a while back for Barabus's Imperial Housing Resource. Well, today I'm making the demo I showed of those resources an official claim, with a row of houses, shops, and a single tavern along the eastern edge of the main plaza. 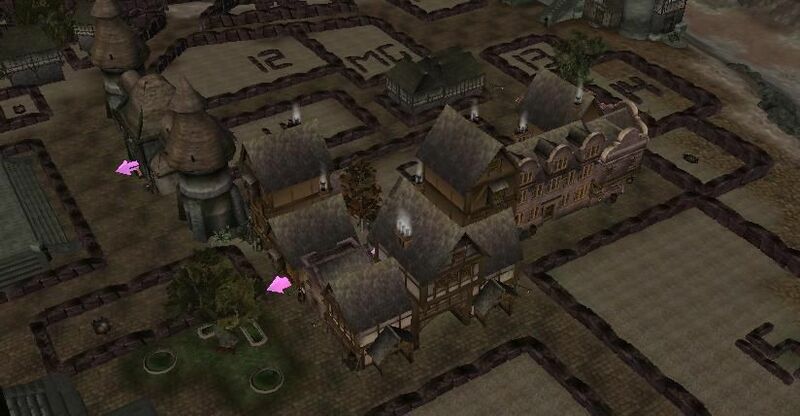 In total, there's 10 buildings in this stretch along three separate streets, including one tavern, two shops, and seven houses and apartment buildings. 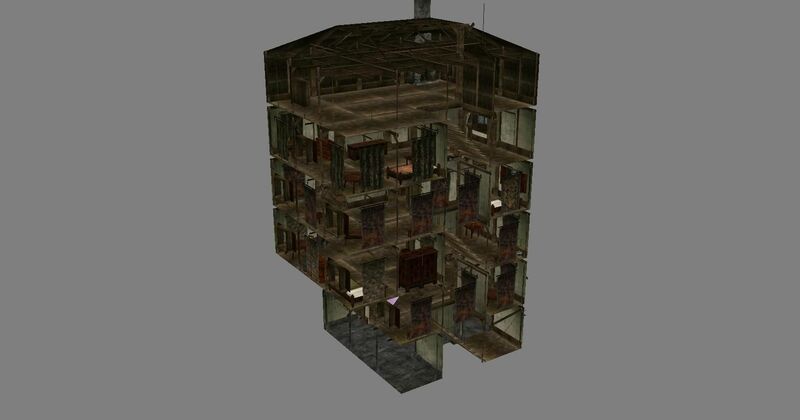 Some of these buildings are quite large, so they'll be acting as apartment buildings rather than single housing units, and a number of NPCs can call these home, such as street vendors and other lower-income NPC classes. 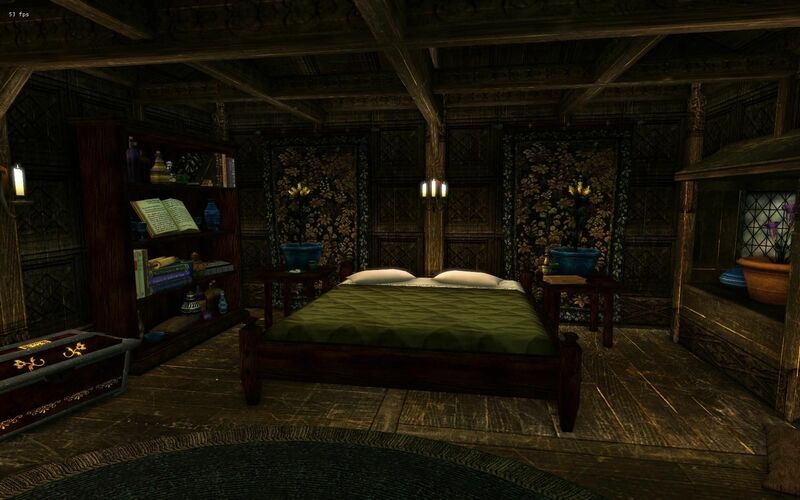 I will be using a fair amount of modder resources in this claim, since the goal is to use modder resources that can then be showcased in episodes of Morrowind Modding Showcases as the "Modder's Resource Mod of the Week", and thus kill two birds with one stone. Hopefully, with 10 interiors, I can get enough content to fill three or four episodes of MMS. Some of these interiors are already complete, I've finished off the first three houses, and the first apartment building is at about 25% completion or so. For now I've got a ton of screenshots below showing off my progress. Small market plaza with shopping stalls. Apartment building and smaller house. 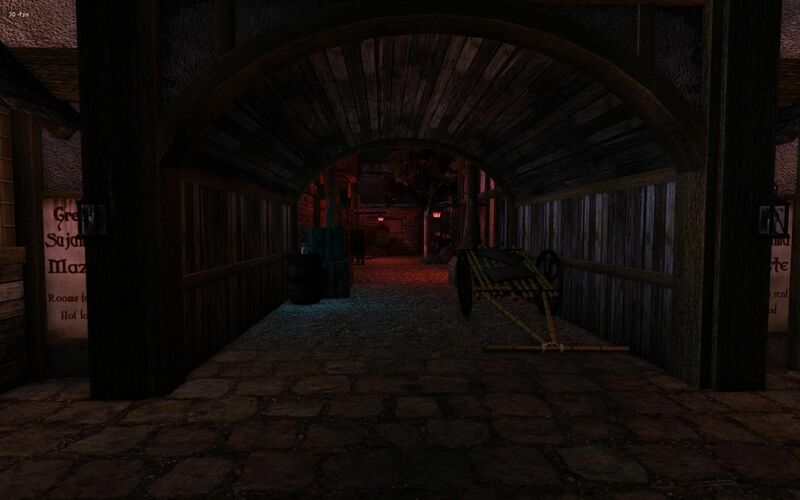 A back alley going past the tavern. Common House 04, Interior CS Shot. Progress: Overall, progress is probably at about 20% for this claim. Alright, so we're a month into the official public posting of ModTown 2015, and out of our initial defined 37 modder plots, we're down to 7 that are still unclaimed. Specifically, plots 11,22, 23, 24, 25, 27, and 28 are the only ones still open. Out of these plots, there's not a whole lot of variety. Only plot 11 is on the western side of the river, sort of in the middle of town. The rest are all on the eastern side, and plots 22, 23, and 24 are pretty small and don't offer a lot of space for development. Our plan is for ModTown 2015 to be finished by the end of December, but until that time people are free to join the project and claim/submit plots pretty much up to the last minute. If we're already down to 7 plots after just a month, that means we'll more than likely run out of plots altogether pretty shortly. Given all of that, I'd like to propose the creation of 11 new modder plots in ModTown, and I've created a map below to show where these plots could be. You'll notice that two of these plots are over ocean space, I thought it might be a good idea to offer water-plots for people who want to make houseboats, floating shack dwellings, or some other sea-faring vessel for their claims. You'll also notice that most of these plots are behind the ModTown Sea Wall, and I think that's actually fine, we don't need to move the sea wall in order to create these plots, we can leave it where it is and pretend that it offer storm protection for the town center or something like that. I've also added a few proposed NPC house/shop claims to this area, just for the sake of keeping the town diverse and not have any one area completely dominated by modder plots. Anyway, what do you guys think? Do you have any alterations you'd suggest, or think new plots should be added in elsewhere?